(Phys.org) —Weimaraners – sleek, athletic dogs originally bred for hunting—are known for their striking, silver-tinged coats. Unfortunately, they also are known for a rare tremor disorder reported widely throughout North America and Europe. Sometimes called "shaky puppy syndrome," the condition occurs almost exclusively in Weimaraners. It first appears in one- or two-week-old pups, and the tremors grow in intensity for several weeks. While the trembling diminishes and eventually stops in most cases, it can make nursing difficult, which may prove fatal without intensive care. Past research suggests that the disease is an autosomal recessive trait-in other words, it only occurs when a gene is inherited from both parents. Now, a new study published in the journal GLIA hones in even further on the cause. The hallmark abnormality in Weimaraners affected by shaking puppy syndrome is lack of myelin in certain areas of the spinal cord. This image from a high-powered microscope shows the normally myelinated axons in the spinal cord of an unaffected control group Weimaraner (left) and the sparsely scattered myelinated axons in the spinal cord of a Weimaraner that is affected by the syndrome (right). Credit: Ian Duncan. A team of researchers led by Ian Duncan, professor of neuroscience at the University of Wisconsin School of Veterinary Medicine, has traced the source of the tremor disorder to a specific gene mutation that curtails the formation of myelin in the brain and parts of the spinal cord. A lack of myelin, a fatty substance that sheathes and protects nerve fibers, can disrupt the electrical signals that nerves send to produce movement. "Insufficient myelin production is called hypomyelination, and it's associated with many genetic neurological diseases in animals and humans, " says Duncan. "In the case of Weimaraners, it leads to notable tremors." The researchers tracked down the mutation through several complicated steps. 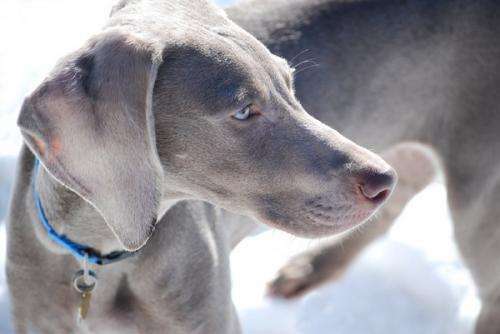 Using samples from three unrelated families of Weimaraners-including dogs with the syndrome and an unaffected control group-they conducted a genome-wide association study, which examines common genetic variants in a group of animals to see if any are associated with a specific trait, such as a disease. This narrowed their search to a single canine chromosome. Next, they sequenced all genes found in specific areas of interest in the chromosome. Gene sequencing determines the precise order of nucleotides in DNA molecules, and in this case it revealed a deleted nucleotide in a gene that encodes folliculin-interacting protein 2 (FNIP2). This mutation causes FNIP2 to be shortened, which results in the hypomyelination found in Weimeraners. "We don't know the exact function of FNIP2 in myelination yet," says Duncan. "But our data suggest that the shortening of this protein delays or maybe even stops the maturation of some oligodendrocytes, which are brain cells that are critical in the production of myelin." One of the research team's goals was to develop a bench test to identify dogs that carry the mutation, which could help reduce or eliminate the disorder through selective breeding. Under the direction of Duncan's co-author, Danika Bannasch, the Veterinary Genetics Lab at the University of California, Davis will soon begin analyzing Weimaraner DNA sample submissions for this purpose. The study of this syndrome also may offer insights for human medicine. A number of developmental disorders in children linked to a delay in myelination have been reported, but the basis for the defects is not yet known. According to Duncan, this novel mutation in the canine FNIP2 gene provides a potential candidate in human disorders and suggests that the human FNIP2 gene should be investigated as the possible cause. "The production of myelin is a complex process, and the genes involved must be expressed in the correct sequence for it to occur normally," says Duncan. "We can understand this process better by examining animals in which it has gone awry due to gene mutations."